Happy National Burger Day! In celebration, I present a grass-fed beef/pork combo, laced with ramps and topped with buttery morels and a quick red wine pan sauce. I would have topped it with a fried egg, but given there’s an egg in the mix, I thought that was a bit over-the-top. That said, you could totally top this with a fried egg and be very, very happy. A burger this decadent is best without a bun (given that I can’t eat gluten, I always eat burgers without buns anyhow), especially topped with those glorious morels. A word about the egg in the mix…I prefer grassfed beef burgers not just for the better treatment of the animals and the quality of the meat, but also for the bigger, beefier taste. It takes a bit of finesse to make a juicy grassfed (or bison) burger, however, even if you choose a higher fat grind. One trick, via my friend chef Scott Pampuch, is to add an egg to the raw burger, along with salt and pepper, before forming the patties. His theory is that grassfed beef fat melts out more quickly than conventional beef fat, and the egg helps hold the fat in. There’s no question that the egg results in a juicier burger, so definitely give it a try! This burger is equal to a steak in my mind, so I asked my friend sommelier Leslee Miller of Amusee Wine for a pairing suggestion. Her awesome answer: “I’d choose St. Innocent ‘Shea Vineyard’ Pinot Noir, Yamhill-Carlson AVA, Willamette Valley, Oregon because it’s rich, yet gorgeously balanced with a bright raspberry/cherry center – an Oregon gem! Combining perfectly with the earthy notes of the mushrooms, this Pinot gives a true expression of Willamette Valley’s terroir. Textured with soft baking spices, yet full with complex flavors of marionberry fruit, rose petal, dried herbs and plum – St. Innocent’s ‘Shea Vineyard’ Pinot Noir’s velvety tannins are weighty enough to pair to the combined meats of the burger, yet snuggle in next to the ramps and morels perfectly. Fabulous through to the last bite. Price: $45.” If you are motivated enough to conjure frites to serve alongside, they would be incredible swiped through that pan sauce. 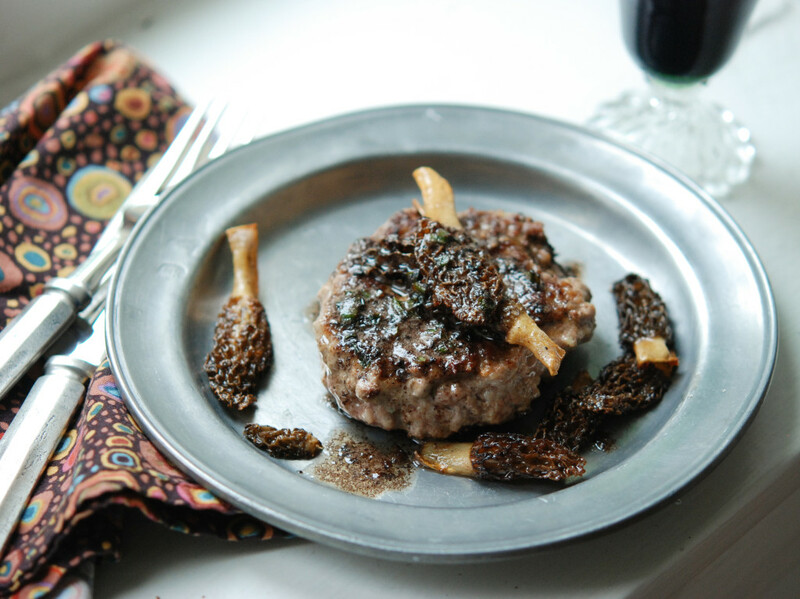 But honestly, this burger can stand alone, which allows the morels to really shine. Despite the fact that it’s National Burger Day, it is more importantly morel season – holy – so indulge while you can. Mmmmmmorels please! Note: I added pork to the mix, although you could certainly go all beef. If you can’t put your hands on ramps, substitute scallions. Put beef, pork, egg, half of the minced ramps, 1 teaspoon of salt, and several grinds of black pepper in a large bowl. Mix gently with your hands until egg and seasonings are just incorporated. Gently form four patties (do not overpack or the burgers will be tough). Heat a large cast iron skillet over medium-high heat. Add 1 Tbsp. of butter to the pan and when hot, add the burgers. Fry for 3 minutes, then flip and fry for 3 more minutes for medium (pink in the middle) burgers. Remove burgers to a plate and set aside to rest. Return pan to heat, turn heat to medium, and add remaining 2 Tbsp. butter to the pan. When the butter is melted, add the morels to the pan. Saute the morels for 2 minutes on each side. 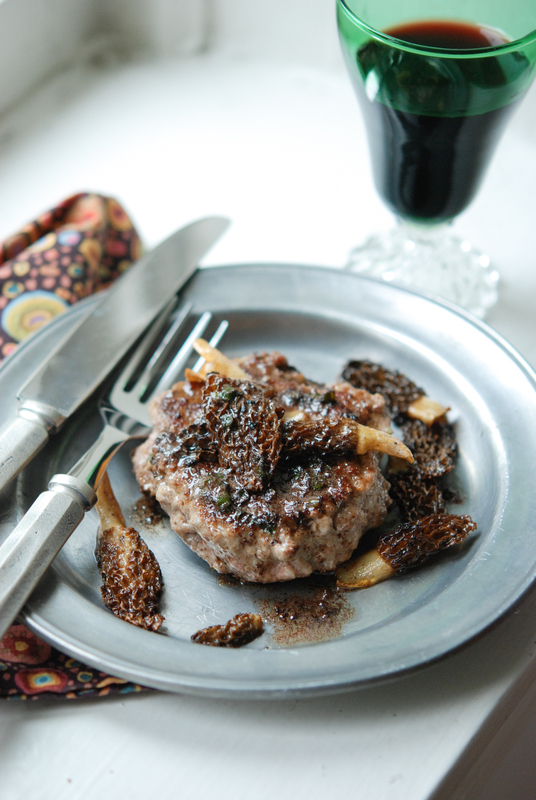 Spoon the morels over the burgers. Return the pan to heat and add the remaining minced ramps. Saute for 2 minutes, then add the wine to the pan, stirring up the browned meat juices and butter. The wine will bubble vigorously when it hits the hot pan. Stir for a minute or two, just until wine is reduced and glazey. Remove from heat and season with salt. 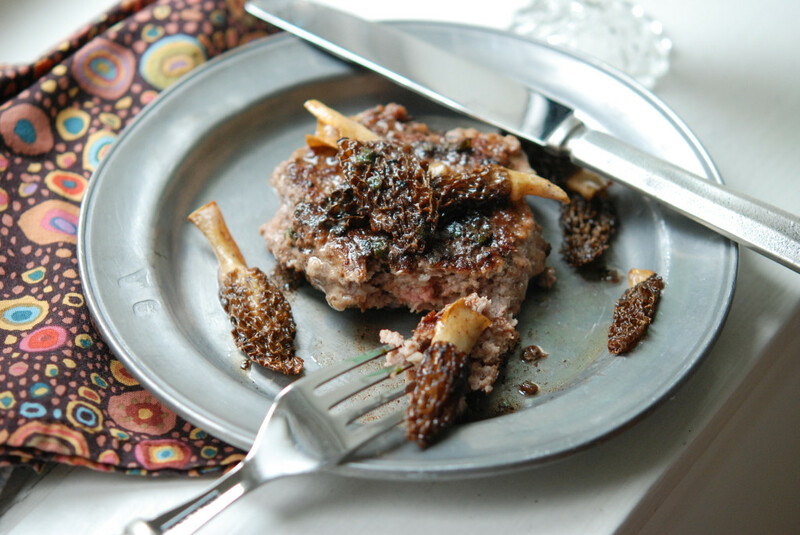 Spoon sauce over the burgers and morels, top with a few grinds of black pepper, and serve immediately.